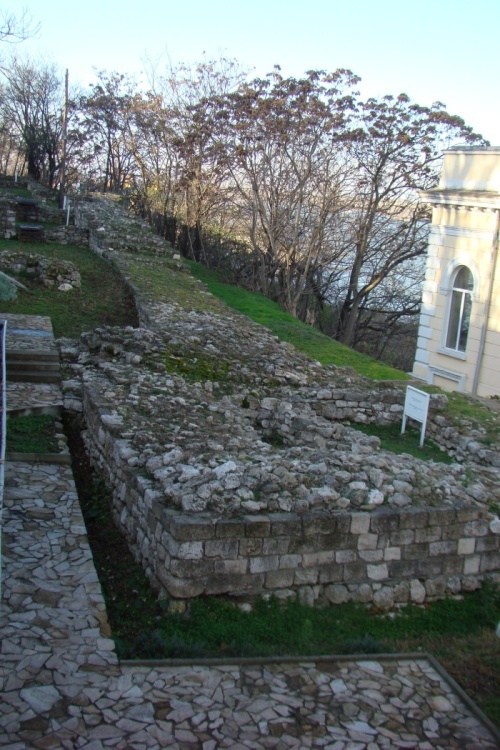 At the end of the 19th century Felix Kanitz localized the Roman fortress and Late Antique center Sexaginta Prista on the high bank of the Danube River in the northwestern part of the present-day town of Ruse, on the basis of the distances indicated in the itineraries. No direct evidence related to the establishment of Sexaginta Prista is known. The earliest mention of its name is made in an epigraphic monument dated to AD 100/101, during the reign of the Emperor Trajan. The results of the archaeological research conducted there in 1976-1980 and 2005-2012 are essential to clarify the overall historical development of Sexaginta Prista. The Late Roman fortress, successor of the camp from the time of the Principate, was built in the late 3rd century AD/ early 4th century AD. Parts of the fortification system, as well as several buildings, including the headquarters (principia) of the military unit have been uncovered. The lack of archaeological materials dated later than the last quarter of the 6th century AD clearly suggests that Sexaginta Prista fell victim to the Avars at the end of the 6th century AD, causing it to disappear forever.